Whether you’re adjusting to the early stages of your pregnancy or you’ve officially entered motherhood with your beautiful newborn bundle of joy, here at uOpen we want to help make every step of your journey as blissful and as effortless as it can possibly be. 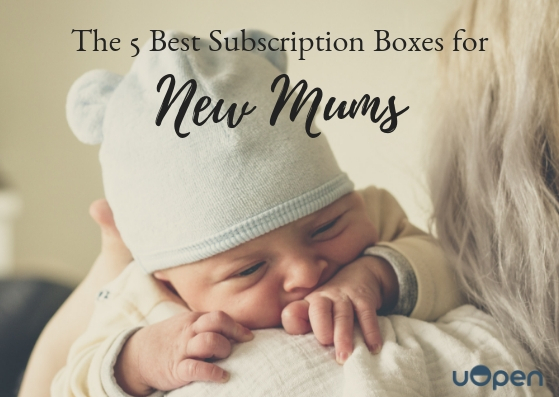 Take a break from your endless worries and racing thoughts about becoming a loving new mother and treat yourself, or your expectant mum friend, to one of our 5 best subscription boxes for new mums. Look forward to the most beautiful monthly surprises that are there to remind you that you are doing a fantastic job! Enjoy your pregnancy to the very fullest with a subscription to Project-B - the ultimate mum-to-be survival pack! Project-B is there to nurture you through each stage of your pregnancy, bringing you the perfect assortment of 5-10 thoughtful items and well-being goodies straight to your door. From the very first ‘Congratulations’ box to the ‘Hospital Bag Time’ and ‘Welcome to the World’ boxes, Project-B has got you covered and fully prepared to take on life as a new mum in confidence. Look forward to exciting treats from some of your favourite leading brands, as well as new discoveries! Lean on Project-B to help you through your truly amazing pregnancy. It’s never too early to introduce the magic of storytime! Whether your little one is on the way or you’re soaking up every moment with your brand new bundle of joy - storybooks are a brilliant way to spend endless amounts of quality time with your baby. The Willoughby Baby Book Club brings you the happiest of tales and beautifully illustrated storybooks straight to your door every month. Read aloud to the fussy little kicker in your belly or keep those little eyes mesmerised with a story full of vibrant illustrations. The Willoughby Baby Book Club delivers one exciting new story to you every month, so you can make every moment as a new mum a little more special and memorable. There’s no denying that entering motherhood for the very first time can be terrifying and perhaps a bit nerve-wracking, to say the least. Which is why it’s incredibly important to remember to take the necessary time to press pause and indulge in some much-needed ‘me-time’. Whether you’re expecting or you’re adjusting to life with a newborn, the Soakbox is the perfect monthly remedy to help you take a little time to just relax. Soaking in the tub will never be the same once you’ve had the ultimate bath bomb experience from the Soakbox. With 6 new full-sized and sweetly scented bath bombs every month, you’ll have no problem setting aside the time to run a hot bath and soak in gorgeous sparkly colours, delicious scents and a hint of Shea butter. Give your skin the ultimate treat with a fabulous selection of bath bombs every month and live your best life as a new mum with a subscription to the Soakbox. On your journey to becoming a new mum, sometimes your mind can wander off into a vicious cycle where thoughts of concerning questions and anxious unknowns begin to take over. It is when that happens that you need to remember to take a step back and trust that no matter what, you will be the best you can be! And to help you do so is the one and only Smile Parcel. From beautiful words of encouragement to pleasant, pick-me-up treats, you are sure to find something to smile about in every box of your Smile Parcel. Each month you can look forward to unwrapping an exciting selection of inspirational quoted items to beautiful household goods or maybe even a lovely, little something to nibble on. Treat yourself and subscribe to the Smile Parcel - here to brighten all your days as a new mother with one box of joy at a time! Life as a new mama can certainly have its ups and downs and finding just the right balance is sometimes easier said than done. However, with Mama Treats you can discover an entirely new and unique approach to de-stressing and relaxation. With 5 handpicked holistic items delivered directly to your door every month, you’ll receive all the tools you need to achieve a harmonious and well-balanced lifestyle as a new mum. From relaxing bath salts and crystal chip stone bracelets to massage oils and soy wax candles, you’ll find plenty of goodies that promote balance, harmony and serenity. Be kind to your journey as a new mum and subscribe to Mama Treats today! Are you preparing for a beloved little new addition to your family? Here at uOpen, we have a beautiful selection of family & kids subscription boxes and also parenting subscription boxes to help you prepare as well as make wonderful and happy memories in every home.